We are very excited to announce our 2017 Open Week agenda! It is going to be the largest and most diverse Open Week we have ever held. Open days are Tuesday 30th May, Thursday 1st June and Saturday 3rd June (all midday – 6.00pm). Fossil Hunting : Pond Dipping : Nature Trail : Bird Watching : Snake Handling : Fossil Displays : Nature Treasure Hunt : Dissecting Owl Pellets : Lots of Fun Games and Quizzes : Face painting (Thursday 1st June only) : Plus much more! (Events marked * – booking essential. Please call 01553 630842). Take a guided tour of the nature reserve and extension with reserve manager Phil Parker. An opportunity to learn more about the reserve itself and the species within it. Grab your magnifying glass and come down to hunt for bugs and insects with invertebrate expert Dr Peter Kirby. You’ll be amazed at what species may be found! Phil Parker presents an illustrated talk about the natural history of the Whittlesey brickpits from the Jurassic to the present day, including the development of Kings Dyke Nature Reserve. Charron will be on site creating a piece of unique art inspired by the nature reserve. Enter our special competition on the day for a chance to win the finished art work! Also an opportunity for children to get creative and produce their own masterpieces to take home. Ickle Pickle Play return for more face painting fun! What menagerie will your children transform into? What can you create from natural resources found in the nature reserve? 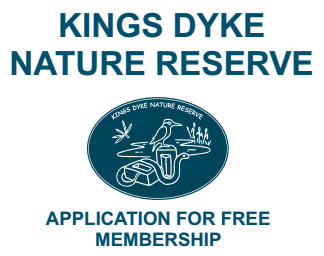 Experience the nature reserve at night and see what fascinating moth species inhabit Kings Dyke. A chance to see/learn about the bird ringing process with licenced bird ringer Alan Bull. A rare opportunity to see species up close before ringing and release. Please note: suitable clothing and sturdy footwear is advisable for all areas. If weather is inclement for the special events, please telephone to check beforehand. Disabled access available to events marquee, bird hide and pond dipping platform.